The vibration blades are close the Guyver's elbows. The vibration from them is of high frequency, it will cut through anything even the bio-booster armour. 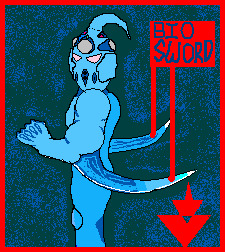 When in battle the Guyver will lengthen the sword like blades near its elbows by over twice it's original size, allowing the Guyver to cut through opponents or anything else standing in it's way. The Gigantic Guyver's blades are huge. they are meters long and are a lot more powerful than the blades from the Guyver's origonal state.